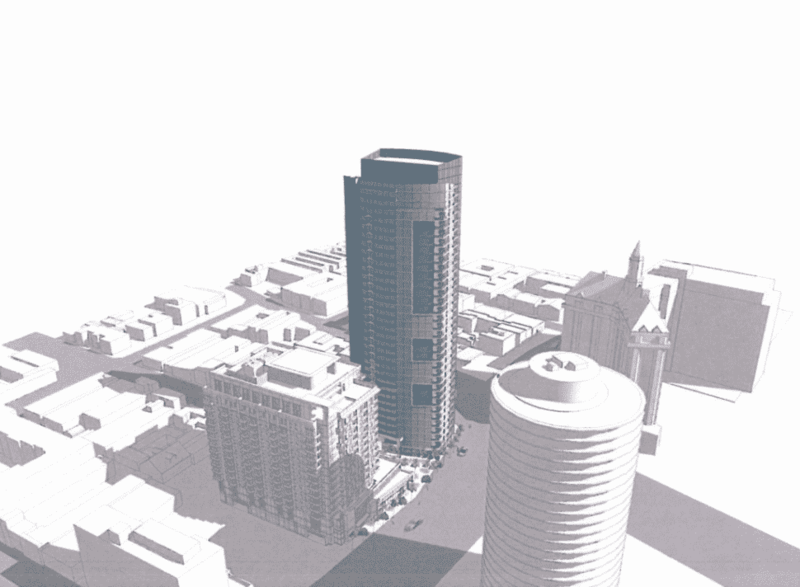 A rendering of the Shoreline Gateway's east tower (right) next to The Current (left). Courtesy of Anderson Pacific LLC. Note: This story was originally published on September 10, 2018; it was updated on October 4, 2018. 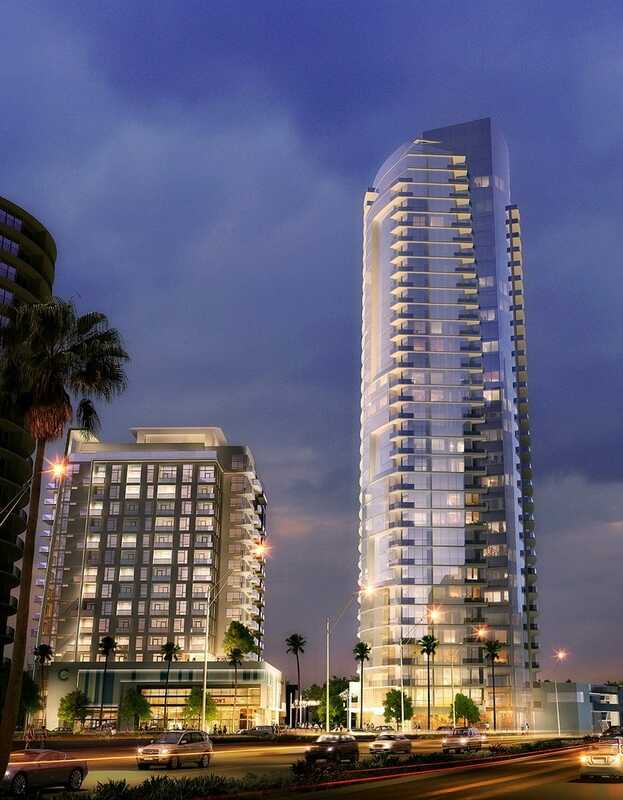 The second phase of one of the largest developments in Long Beach, at Ocean Boulevard and Alamitos Avenue, officially broke ground today, bringing Long Beach tallest building one step closer to reality. Following completion of the $70-million, 17-story Current tower, the footprint of the 35-story East Tower just to the east of Current has long been a part of the original plan. In fact, before the Recession of 2008, the Shoreline Gateway tower was supposed to be built first, followed by the Current; plans obviously altered post-recession, with the Current opening its doors to rising rents and controversy in 2016. The Shoreline Gateway tower was set to hold 221 units with 6,367 square feet of ground floor retail. However, given an update from the original proposal by Shoreline Development Partners, developers have added 94 more units and 344 square feet of additional retail space on top of its original proposal. This rendering shows the scale of the Shoreline Gateway’s east tower compared to other Long Beach landmarks, like the Villa Riviera. Courtesy of Anderson Pacific LLC. This would put the Studio One Eleven-designed building—set to be the city’s tallest at 417 feet high, usurping One World Trade Center which currently stands at 397 feet—at 315 residential units and 6,711 square feet of retail space. Additionally, the previously-approved 393 parking spaces will increase to 458 while pushing the subterranean parking garage from two levels deep to five along with a 10,000 square foot plaza will conjoin the new tower and the Current. There will be 11 different types of units including two studio unit designs (ranging in size from 500 square feet to 520 square feet with a 52 square feet balcony); six one-bedroom unit designs (all with balconies and square feet ranging from 720 to 1,132); and three two-bedroom unit designs (all with balconies and ranging in square feet from 1,032 to 1,176). When the project was first unveiled in 2003, the site was to have three towers: a 22-story residential tower at the northwest corner of Ocean and Alamitos Avenue, a 15- to 19-story stepped slab building on West Lime Avenue and Ocean, and a 10-story building northeast of the existing Artaban Building. For a rendering of this older project, click here.